The Saint Paul CBD consists of 7,645,357 square feet of Competitive office space. For the purposes of comparison, this office space is grouped into three classes, A, B & C. These classes represent a subjective quality rating of buildings which indicates the competitive ability of each building to attract similar types of tenants. A combination of factors including rent, building finishes, system standards and efficiency, building amenities, location/accessibility and market perception are used as relative measures. 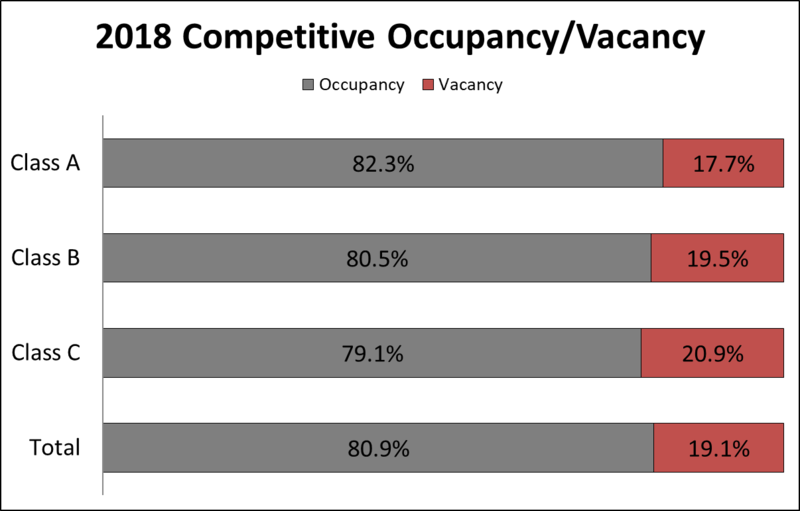 The overall vacancy rate for Competitive office space in the Saint Paul CBD is 19.10% (1,458,167 square feet), a decrease from 20.80% (1,650,173 square feet) in 2017. Vacancy is lowest in Class A space (17.70%) and highest in Class C space (20.90%).